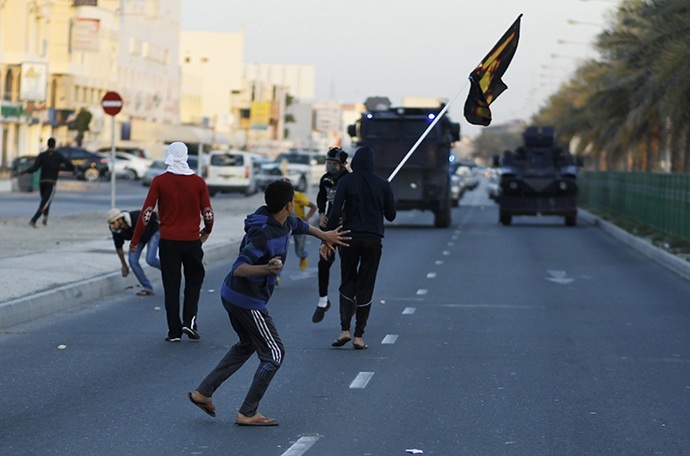 JNN 14 Feb 2014 Manama : Clashes with police have marked the third anniversary of the Bahrain uprising that had seen numerous human rights violations by the government and wide social discontent of the majority Shia population with the minority ruling Sunni monarchy. At least 29 people have been arrested during the clashes. Some pictures of the unrest and the aftermath of police crackdown were posted on twitter by Alwefaq National Islamic Society, the main opposition party in Bahrain. Thursday was the beginning of the three-day-long protest event called by the ‘February 14 youth coalition’, the Shiite-led opposition, to mark Friday’s 3 year anniversary of the popular protest. Anti-government movement supporters were urged to once again occupy the Pearl Square, the cradle of the revolution where activists camped out in 2011 before the Bahraini, Saudi and UAE troops smashed the uprising. Fearing violent reprisals by the government, Amnesty International issued a caution against violence at Friday’s demonstrations. “The anniversary’s protests are a test for the authorities to demonstrate internationally that they are committed to protecting human rights. They must allow the peaceful exercise of freedom of expression, association and assembly and release all prisoners of conscience,” said Said Boumedouha, Amnesty International’s Deputy Director for the Middle East and North Africa. Just this month the king of Bahrain signed a bill imposing a 7-year jail sentence and a fine of up to 10,000 dinars ($26,500) for those who insult him. This follows July’s measure of indefinitely banning demonstrations, sit-ins or public gatherings in the capital. The Gulf Island, the base for the US Navy’s Fifth Fleet, has faced increasing criticism over its human rights violation in the past three years, where at least 89 people have been killed since the launch of the uprising, according to the International Federation for Human Rights. Following the immediate waves of unrest, in February and March 2011, the Bahrain Independent Commission of Inquiry (BICI) was established by the King of Bahrain in June to investigate the violence. In a 500 page report the probe recorded 46 deaths, 559 allegations of torture, including torture of children, and more than 4,000 cases of employees fired for joining the protests. BICI has also submitted a number of recommendations to ease tensions. “As yet, the authorities have failed to implement key recommendations made by the Bahrain Independent Commission of Inquiry (BICI) in 2011,” Amnesty International says. Continuous violations of human rights through the arrests of political dissidents, doctors, demonstrators, including children, have been widespread throughout the 3 year old struggle. The government also stepped up the arrests of many cyber activists. Media outlets also witnessed a major crackdown both online and offline. Last month’s report issued by a Bahraini human rights body said that 745 protests took place in December alone. The government’s reaction to dissent, according to the study, included mass arrests, including detention of 31 children. According to Liberties and Human Rights Department in Al Wefaq Society, at least 17 torture or ill treatment cases of the detainees were reported. Delayed peace talks between the Sunni ruling family and the Shiite opposition have recently revived but have not yet made progress, as massive distrust reigns between the opposition and Khalifa family. This entry was posted in Middle East and tagged 3rd, Amnesty International, Anniversary, Bahrain, Human rights, human rights violation, human rights violations, king of Bahrain, Population, Revolution, shia. Bookmark the permalink.